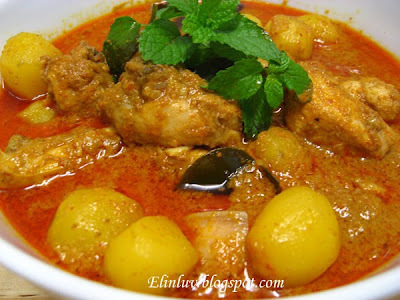 This is another favourite curry dish of the family. 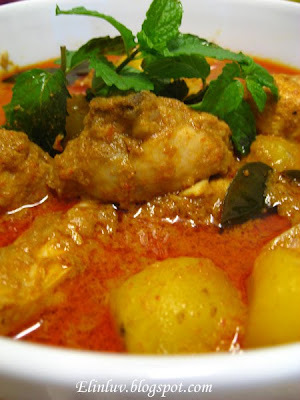 We love this chicken curry for it could be eaten with plain rice, yellow glutinous rice or eat it with plain bread . 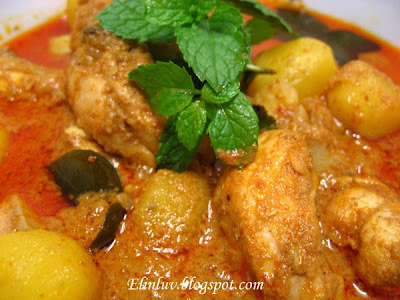 This curry is so flavorful coz I added in some kaffir leaves to enhance further the flavor of the curry. Heat up oil in a cooking pot over medium heat and add in the ingredients A and saute till fragrant and the oil has surface . Add in the chicken pieces and stir fry till the chicken is ¾ cooked. Add in ingredient B and the baby potatoes , lower the heat and simmer till the chicken and the potatoes are cooked through. Add in (C) and simmer for another 20 minutes. Add salt to taste. 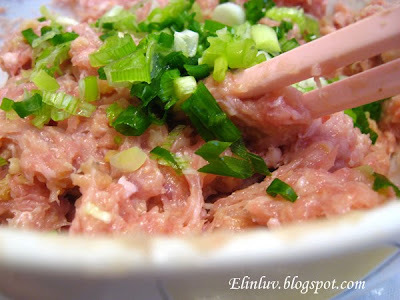 Mix all the meat filling ingredients together and stirs with a pair of chopsticks till all the ingredients become a sticky paste. 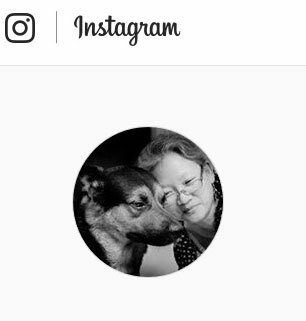 Leave aside. 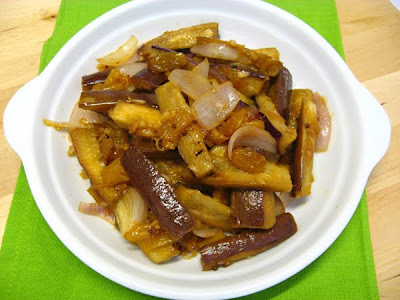 Cut the bitter gourd and aubergine into ½” thick slices. 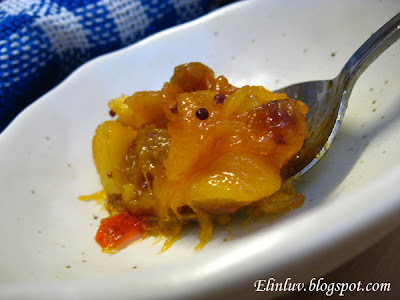 Remove seeds from the bitter gourd. Cut a slit through the chillies length wise and remove all the seeds. Cut tofu diagonally and on each triangle cut a slit. Soak the dried shiitake till soft and remove the stem. Stuff all the cut vegetables with the meat filling. 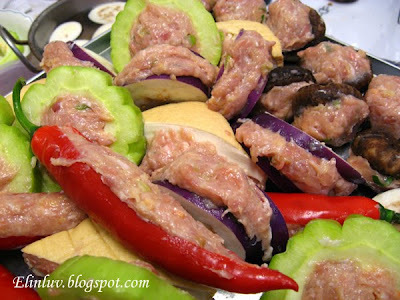 Apply some corn flour on the surface of the meat filling before putting them in hot oil and fry till cooked. 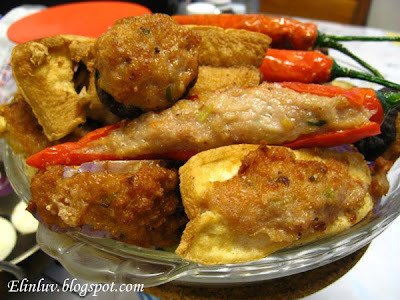 Dish up and place them in paper towels to absorb the oil from the fried stuffed vegetables. Meanwhile , heat up the wok with 1 tbsp of oil and put in all the gravy ingredients except the thick soysauce, sugar and thickening and sauté till fragrant. 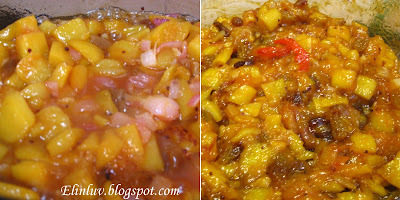 Add in 2 cups of water and simmer till it boils. 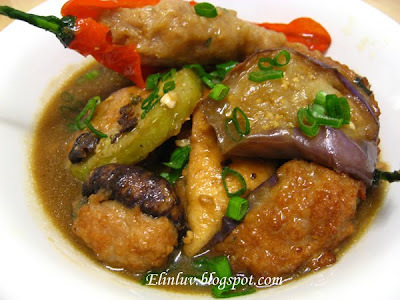 Add in the thick soysauce , sugar and thickening When the gravy has thicken, add in all the stuffed fried vegetables into the gravy. When it boils, off the fire and dish up and garnish with some chopped spring onions. 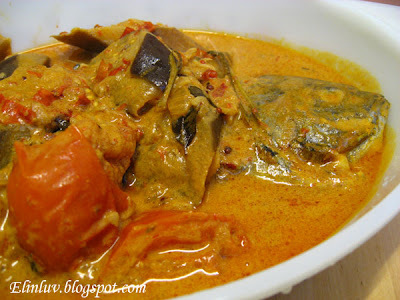 The fastest curry that I can cook up in just less an hour is this tamarind fish curry. Simple steps in the preparation and yet deliciously appetizing. With this , the whole family gets to enjoy a really nice dinner . Anything hot and spicy will have all the heads nodding in agreement LOL ! 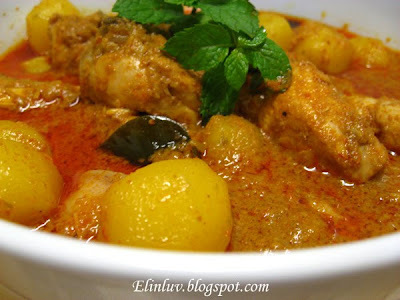 So easy to please them as long as it is CURRY! 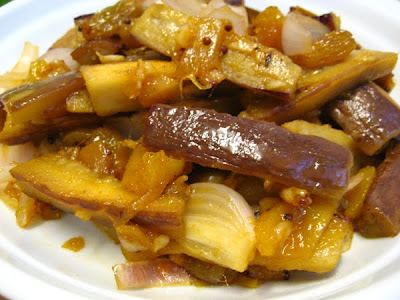 Heat up the olive oil in a wok, add in the shallots , garlic , lemongrass, curry leaves, mustard seeds and sauté till fragrant. Add in the curry powder paste and grounded chilli paste and continue to sauté till the oil come to the surface. 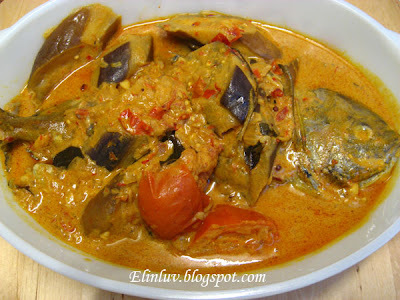 Add in the aubergine slices& tomatoes and the evaporated milk and cooked till the aubergine slices are soft. 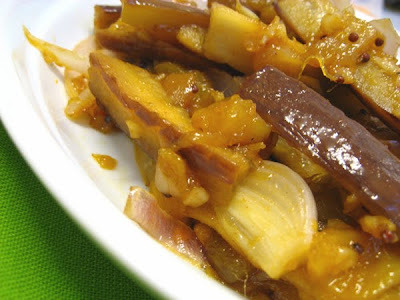 Add in the tamarind water and the coconut milk and continue to cook for another 10 minutes under small flame. 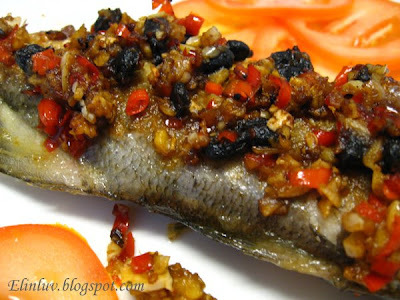 Add in the promfret last, simmer the curry till the fish is cooked. Add in sea salt to taste. Dish up and serve hot with rice. the scent is out of this world. and the infusion it makes is absolutely magical. to reduce the calories and burn up the bad cholesterol!!!!! I really have to stay away from this stall..
temptation is too great here....LOL! 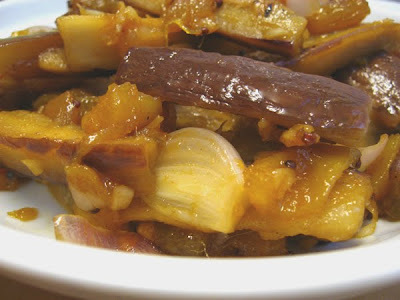 Saute the ginger and garlic with the olive oil in a pot till fragrant. Pour enough water for the soup into the pot and boil for ½ hour and let the ginger and garlic infuse into the soup . 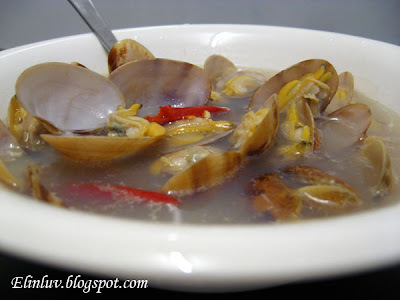 Put fire to high and let the soup boils rapidly for another 5 mins, add in the clams , chilli padi and the wine together and stir till well mixed. 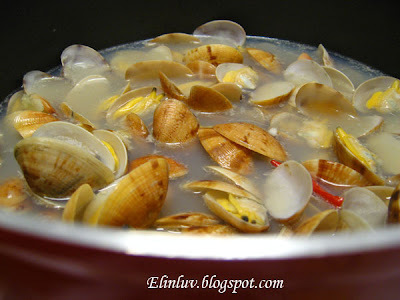 When the soup boils and the shells are opened, off the fire and add sea salt to taste. Serve hot. 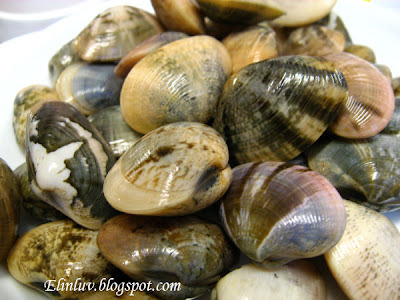 * Do not overcook the clams, the meat will become hard and shrink in size. Pound garlic, ginger and cinnamon bark in a pestle and mortar using some salt as an abrasive. 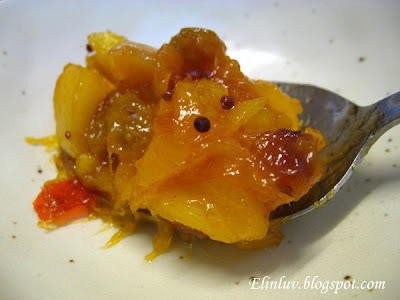 In a medium bowl put in the ginger/garlic paste, add tumeric powder, some ground black pepper mango chutney, vinegar and the lovely mustard seed paste. 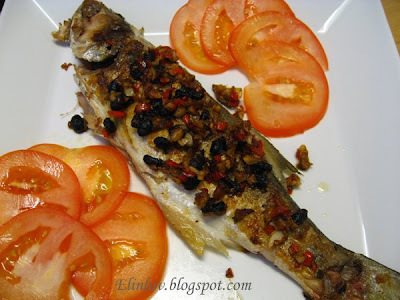 Mix tehm all around and add some pepper or cayenne pepper if you like to spice it up. 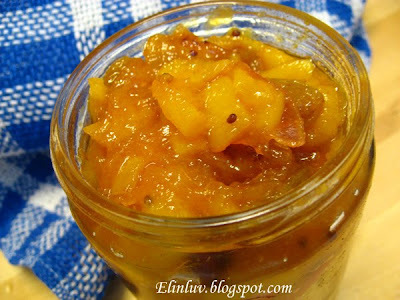 I have always wanted to try making mango chutney and I managed to pull out the lazy bones out of me and tada , a bottle of mouth watering mango chutney. I dedicate this to Zurin of Cherry On A Cake. over the stove stirring this golden richness ! Combine sugar and vinegar in a pot; bring to a boil, stirring until sugar dissolves. 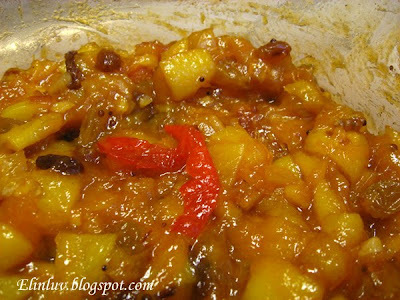 Add remaining ingredients and simmer, uncovered, until syrupy and slightly thickened, 45 minutes to 1 hour. 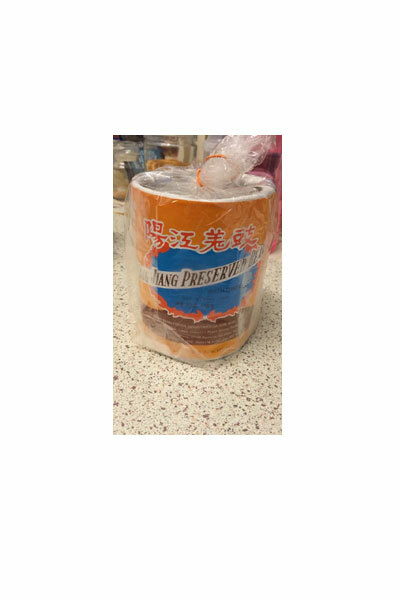 Stir occasionally during cooking. 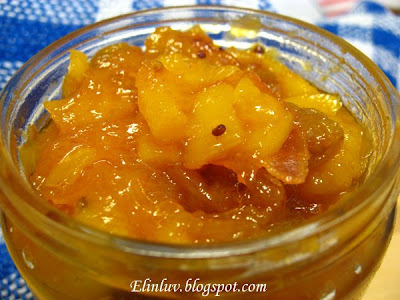 Pour into clean jar and cool it before keeping it in the fridge . to sauteed the black beans mixture....fast enough? 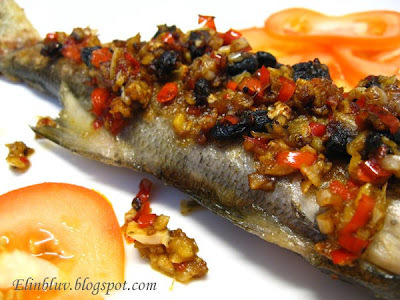 Pan fried the fish with a little olive oil in a non-stick pan till both sides are lightly browned and cooked. Put aside the fish. 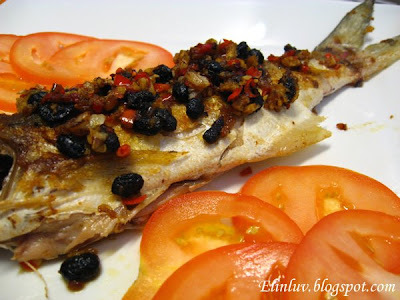 Saute garlic, chilli padi, salted black beans and fermented soybean with the remnant of the olive oil in the pan till fragrant. 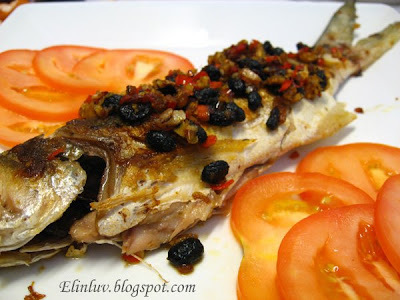 Dish out the fish and scoop the sautéed black beans mixture on to the fish. Serve hot . Yesterday, I was in the mood do a bit of cooking, actually I felt remorseful becoz my other half had to endured those one dish meal I prepared for him lately :p . So I decided to go back to cooking rice for him, being the staple food for him…haha I can go without rice for a month but he can’t, he is a ‘fun thung ’ meaning he is rice taker :))) So I pan fried a fish ( cuming up in my next post ) and cooked this savoury tofu dish for us. 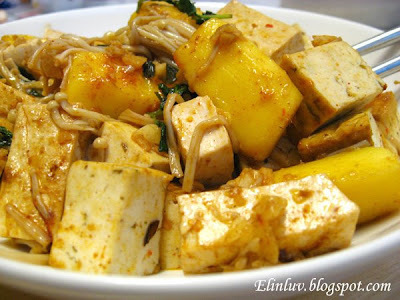 I have been cooking tofu the same normal way day in day out , either steamed them with fish paste or baked them with toppings but for this time , I stir fried them with mint leaves, mango and enoki with a dash of paprika and chilli flakes with lotz of chopped garlic and olive oil. Well…the beautiful exotic aroma filled the room as I was frying this dish…Daddy ran to the kitchen asking me “ what are you cooking that even Chaco sneezed! ” The garlic blends well with the paprika and chilli flakes powder and when the mint leaves were added into the dish…mamamia! 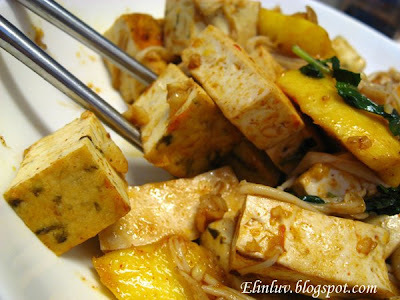 Perfect combo and thus making this bland tofu into a delicious dish. 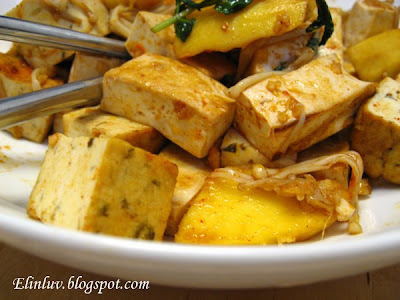 If you love garlic & mint leaves that is…this is one best way to cook the bland tofu. 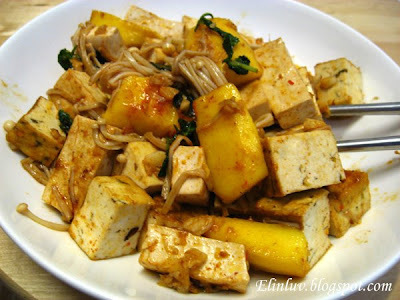 spicy....this tofu dish is tasty and aromatic ! Pan fry the diced tofu with olive oil on a non-stick pan. Push it aside and sauté the garlic till fragrant but not browned . Add in the enoki to the tofu and continue to stir fry till the tofu and enoki and well combined. Add in the mint leaves and mango. 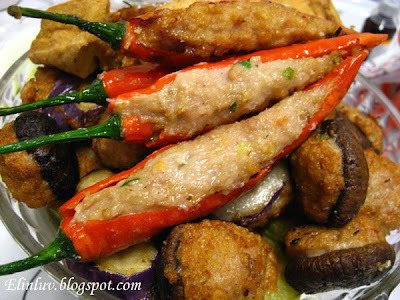 Sprinkle the paprika and chilli flakes onto the tofu mixture and stir fry till aromatic. Add salt to taste. Dish up and serve hot. 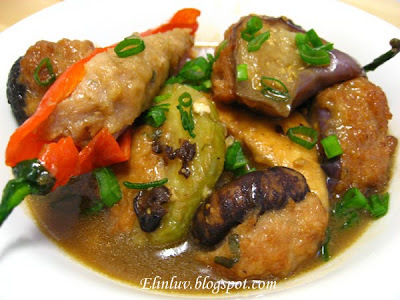 This dish can be eaten alone or serve with hot rice. Our dinners menu lately are mostly all in one…cooking one dish meal is so time saving and less washing :) and it is normally a well balanced preparation . Tonight’s dinner menu was Udon In Seafood Soup. 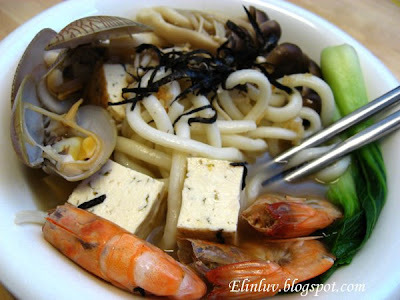 There were veggie , seaweed tofu, fresh Korean mushrooms, enoki , prawns and sea clams. The soup base is chicken flavoured undertone and I added konbu to make it more tasty and aromatic. The soup was boiled for ¾ hour under small fire to allow the flavor from the konbu to infuse into the chicken soup. 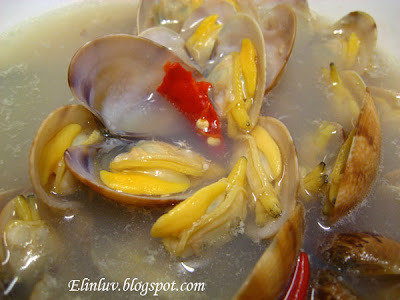 I added in the prawns and sea clams to make up the soup base. Once the prawns turned red and the sea clams has opened up, I added in 1 tablespoon of sake mirin into the soup for extra flavor. Whoaa..the soup was tasty and flavourful. I included some bok choy , korean mushrooms, enoki and seaweed tofu to the Udon thus making this one dish meal a delectable one! And to make it more complete, I garnished it with some nori strips..YUMMY is the word! 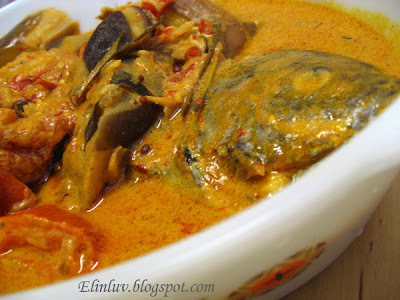 Boil the above soup base ingredients in a soup pot for ¾ hours under small fire till the flavor of the konbu is infused into the soup. 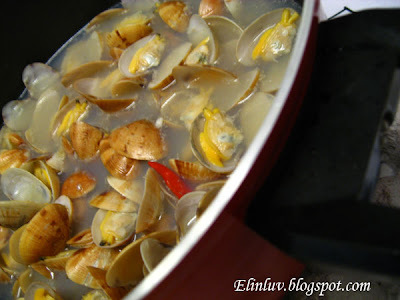 Add in the prawns and sea clams and boils till the prawns turned red and the sea clams are opened up. Add salt to taste. Turn off the fire and leave it aside until needed. 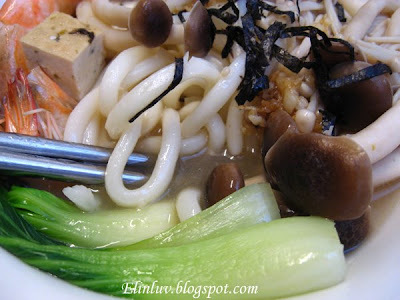 Blanch the bok choy, seawood tofu, enoki and the fresh Korean mushrooms. Drained and leave aside. 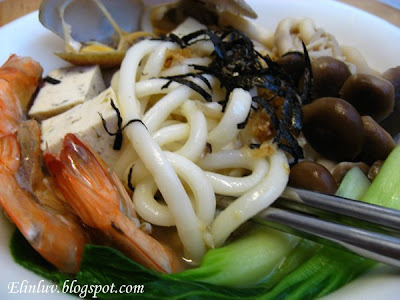 Serve the Udon in a bowl with all accompaniment ingredients , pour the seafood soup over it. and garnish with nori strips ,fried garlic and some garlic oil. First time baking a quiche…and to my surprised it turned out delish! 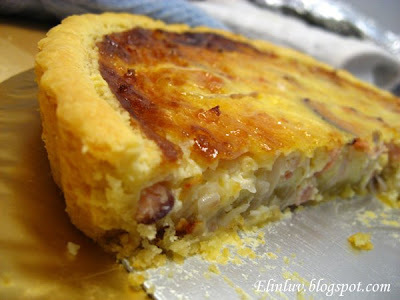 I baked this Quiche Lorainne for Piggy Cuz... for I know she loves quiche :) While it was baking in the oven, the wonderful smell of bacon and cheese filled the air and ‘ Chaco ’ ( my 4 legged son :p ) was eyeing the oven all the time :)) Hoping it will pop out of the oven into his bowl…wishful thinking on his part! It was quite easy to make and the recipe was juz nice for my 9” tart pan with detachable bottom. I will definitely make this again when the Piggies are home…this is just a try out. mozzarella and cheddar cheese ! 2.Bake the sliced bacon for 7 minutes in the oven. Take it out and leave to cool. 5.Grease the 9” tart pan with a detachable bottom . 6.Put the dough in and press till the whole tart pan is lined with the dough. 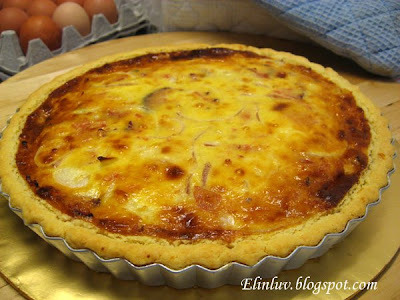 7.Beat the eggs together with the fresh cream , add in the mozzarella cheese, grated cheddar cheese and onions to the egg mixture and mix together till well combined. 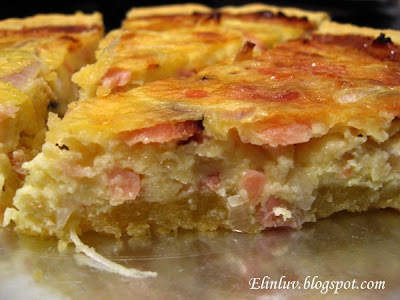 8.Crumble the bacon slices into the egg mixture and stir till well mixed. 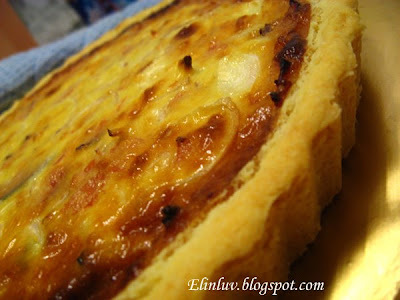 9.Pour the filling mixture on the crust and spread out evenly. 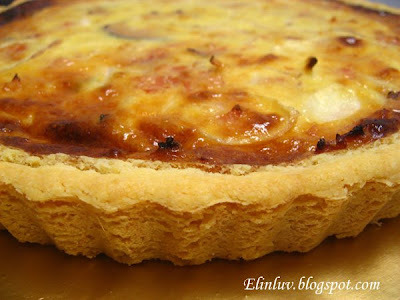 10.Bake the quiche for 30 minutes or till evenly browned. Leave to cool for a few minutes, then serve with salad of your choice.